You may not have considered it until now but using the right electronic waiver system can improve your business. Not only in terms of protecting against liability, but also saving time, growing revenue, and improving your marketing strategy. You may not have considered it until now but using the right electronic waiver system can improve your business. Not only in terms of protecting against liability, but also saving time, growing revenue, and improving your marketing strategy. So, what are these amazing benefits and how do you get them? Let’s take a look. If there’s one thing every business owner can agree on it’s that there just aren’t enough hours in the day. Whether it’s client work, administrative tasks, or trying to steal a little free time, there’s always something vying for your attention. Whenever you find an opportunity to save a few moments – consider it a victory. And WaiverForever can help. Our cutting-edge software includes multiple options to help customers complete their online waivers ahead of time. Making local check-ins faster and easier for everyone involved. Online Signatures – Allowing you to include links to waivers on your website or within emails. Using any modern browser (Safari, Chrome, or IE9+), customers can open the link and sign the waiver using a keyboard and mouse. Automatic Emails – Confirmation emails are the standard when customers buy tickets, book an appointment, or schedule an event. So why not take advantage of the opportunity? Our software lets you embed waiver links or QR codes in the same confirmation message. You get completed waivers ahead of time and clients enjoy faster service using QR codes at check-in. Waiver Widgets – Not wild about inserting text links on your website or emails? No problem -we’ve got you covered. Using WaiverForever, you can generate a custom button for your site that links directly to your waivers. You have full control over the button color and text to ensure it accurately reflects your brand and messaging. Best of all, your online waivers take care of themselves! No more manually uploading data or inputting customer info. Everything is done automatically and stored safely and securely in the cloud on your behalf. Another common issue with traditional waivers is being prone to errors. If customers have poor handwriting – or rush to complete the form – the result is typically an illegible document. Leaving frustrated employees to decipher the mess and hope they get the information right. Bad data is not only a liability concern but a missed marketing opportunity as well. If waivers are not complete (and correct) they offer little to no value. After all, you can’t spread the word about promotions or sales without proper contact info. By going digital, WaiverForever eliminates this problem. Our online forms are easy to read, and the data can be seamlessly transferred to your preferred CRM or marketing application. No more second-guessing names, emails, or phone numbers. No more wasted time having staff copy the same info from one system to another. The entire process is automated. And by indicating required fields, you’ll never have to worry about missing out on key information or details. Incomplete forms are rejected until all boxes are filled using the data options you choose. A reliable process that’s fast, convenient, and error-free. Protecting confidential information is a big deal these days. Companies caught leaking sensitive client data often face hefty fines or stiff penalties. But with WaiverForever, you don’t have to worry. Your waivers are stored safely in the cloud using bank-level security. All data transmissions between our servers utilize SSL technology and are encrypted using AES 256 – the industry standard for privacy and reliability. And with automatic online backups, you won’t have to worry about losing paper forms or guarding them against unauthorized access. Yet, your data is still available whenever you need it from any internet connected device. Who says security and convenience can’t go together? As you continue to grow, it’s important that the tools used to run your business work together. Creating a seamless ecosystem to easily share data between applications. Doing so increases your leverage and helps to get more work done in less time. WaiverForever includes native support for popular email platforms such as MailChimp and Constant Contact with several others in the works. 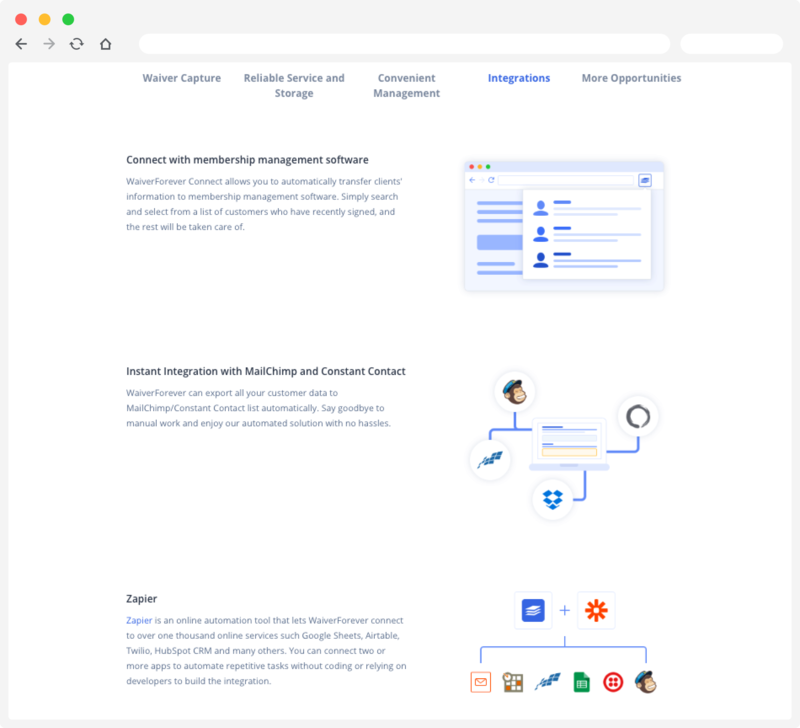 Say goodbye to hours of manually importing new contacts and updating distribution lists and hello to hassle-free automation. Our online waiver software includes integration with Zapier – one of the biggest online automation tools in existence. Creating powerful combinations to connect your WaiverForever account to thousands of online services. Popular apps like Google Sheets, Airtable, Twilio, and HubSpot CRM (just to name a few). And with dozens of new integrations planned for the future, your online waiver experience only gets better! No matter how good the results are, apps are a waste of time if they’re difficult to use. Modern business demands programs that are fast, affordable, and simple to operate. 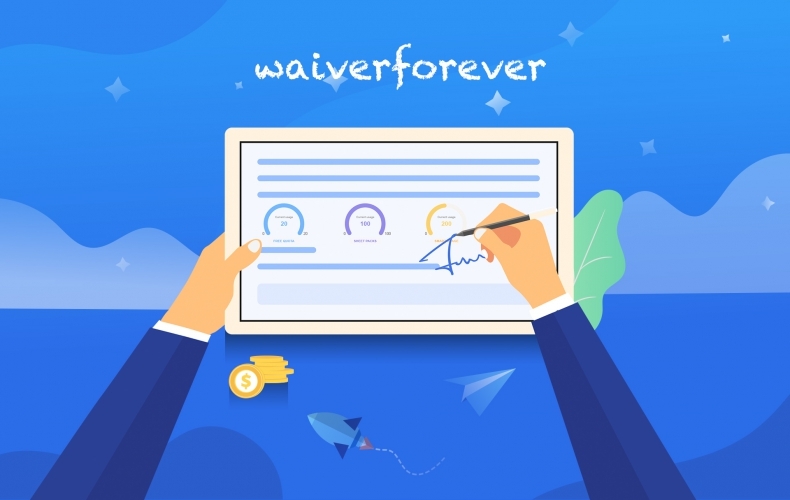 What truly sets WaiverForever apart from the competition is the dead-simple waiver creation process. Our intuitive drag-and-drop editor makes building attractive, high-quality waivers a breeze. And with so many options for delivery, implementing online waivers has never been easier. If that weren’t enough, you can collect signatures from virtually any mobile device. Whether it be a tablet, cellphone, or laptop. Our kiosk-mode software keeps your waivers front and center and allows customers to sign virtually anywhere. Best of all, you can still collect signatures even without an internet connection. Data remains on the local machine (until the connection is resumed) then gets automatically uploaded to the cloud afterward. This powerful feature allows you to run your business from virtually anywhere. While it’s nice to have an accurate customer database, names and addresses represent only a sliver of the marketing puzzle. Analyzing and using your data is where the real value lies. WaiverForever includes an array of analytics tools built directly into your dashboard. Our powerful search functionality helps you to better understand customer behavior. Easy to read reports and graphs show where customers are coming from and which services or promotions are doing best. You can view individual waiver performance or analyze your entire collection as a whole. Use this information to modify, test, and improve your marketing efforts and increase revenue. After all, the information is already there. Why not put it to good use? Let’s face it – we live in a digital world. We bank with our phones, shop online, and run our businesses over the web. So why use an antiquated waiver system? More than ever, customers expect their lives to be digital. Embracing this movement shows clients your brand is relevant and up-to-date with modern standards. Because electronic documents are an extension of what they see every day at work, the doctor’s office, or their local gym. WaiverForever keeps you current and helps your brand portray a professional image (no matter what size your team might be). Using secure online waivers provides peace of mind, saves time, and makes for a better overall user experience. Using a program like WaiverForever can improve your analytics, marketing efforts, and help you stand out from the competition. If waivers are already a part of your business – or if you’re thinking of adding them soon – it only makes sense to go with the best. And with so many benefits included at such a reasonable price – you’ll wonder why you didn’t make the switch to online waivers sooner.